A few months ago, with the shade of bribery accusations looming over his head, Prime Minister Benjamin Netanyahu and the leaders of his coalition decided to hold early elections. Today, citizens of Israel head to the polls to determine the direction of the country. And yet many here will be watching—even casting their ballots—while ignorant of key issues and the elections process itself. Young people, in particular, are informed either through election panels at school or exposure to candidates and their opinions online. They don’t get to talk about the various agendas with real depth, and they don’t hear the differing points of view that shape Israeli society. Their experience learning about the elections is a far cry from the immersive dialogue of Camp—an absence that Seeds look to us to fill. As an organization, Seeds of Peace doesn’t advocate for a given political solution or tell others what to believe politically. And in a country as divided as Israel, all politics are deeply personal. So how can we engage our community around this event that matters so much to them? 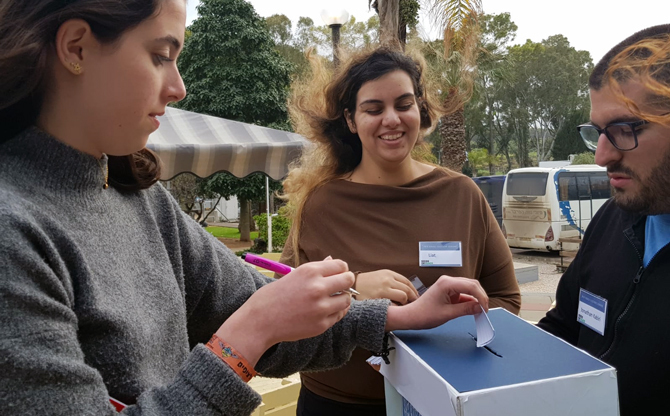 Our solution was the Israeli Elections Seminar, which brought 60 Seeds between ages 16-18 together for an immersive two-day experience in late March that simulated the campaign process. As participants began to arrive, 20 older Seeds who volunteered to run the seminar randomly divided them into different groups representing political parties. They had no idea of the structure of the seminar beforehand; seeing their faces twist into shock as they read the parties assigned on their name tags was thrilling. The participants had to study their party’s agenda, run a campaign based on the ones happening in real life, react to news and press releases, and create propaganda. They also had to appoint chairs and speakers for their groups, share their own press releases, hold press conferences, and represent their parties in a big debate event. When we talked about economics, the groups had to respond with appropriate partisan responses. When we spoke about human rights, governance, minorities, religion, democracy—they had to know the subject, understand their role, and represent their side’s view. To simulate the role social media plays in shaping elections, we published over 300 fake news alerts in a WhatsApp group that the parties had to respond to. The extent that these set our political narratives took them by surprise, and I hope this takeaway informs their conversations, both online and off. I don’t think many Seeds had ever thought about the speed and intensity of the reality our politicians live with before. One such moment was when the WhatsApp group sent out a fake alert of a national security incident during breakfast. The “prime minister” and four other coalition members had to excuse themselves from the meal, just as they would have to if they were at an event in real life, to deal with the incident we created. They had to convene, like the Cabinet would, and publish their decisions. One Seed told me that she came to the seminar with a definite political opinion about the party she supported, only to realize that she actually supported another party after learning the different platforms. I hope that others also left with a better understanding of their own beliefs, either by finding common ground on issues with a party they wouldn’t expect, or by the opposite. Bashar Iraqi, our Palestinian Program Director, was instrumental in providing a Palestinian point of view. He spoke about the influence the election may have over Palestinians across the region. Other speakers included a Knesset member, a former high-ranking diplomat, and a feminist activist. It was a busy weekend, and a powerful one. The participants learned about the different parties in the Israeli political system; they learned how to critique, explore and choose their personal views; they learned how to represent something that they don’t necessarily support, and how to understand where your opposite is coming from. We like to say that treaties are made by governments, but peace is made by people. Understanding a range of viewpoints, whatever that may be, is so crucial. As Israeli citizens cast their ballots today, I hope this is a lesson we all take to heart.